"The humped bull (Bos indicus) has a long and special association with India. Its association with Siva, its all pervading holiness and its basic usefulness in agriculture and commerce for than four millennia are too well known to need description. Its peculiar importance extends back to prehistoric times. We see it represented on the seals and in the terracotta figurines of the Indus civilization where it is clearly differentiated from other types of bovines. It is also by far the commonest subject of rick paintings and terracottas associated with prehistoric and historic sites outside the Harappan culture area, and from the mid-third millennium forward. Throughout western India wherever animal remains from archaeological sites have been studied bovine bones predominate; and there is general agreement that these nones represent in the main Bos indicus. Cattle bones have also been discovered in Mesolithic rock shelters in cntral India and at stratified open sites in Rajasthan, and these may well be even earlier, but detailed studies have not yet been published. The genesis of Bos indicus in relation to other breeds of cattle, and particularly Bos primigenius, has been the subject of various viewes. Zeuner held that it was derived from an indigenous wild form, perhaps Bos nomadicus, cattle of the Indian Pleistocene [from about 2.5 million to 11 thousand years ago], and this is still a convincing hypothesis, although firm data are still wanting. 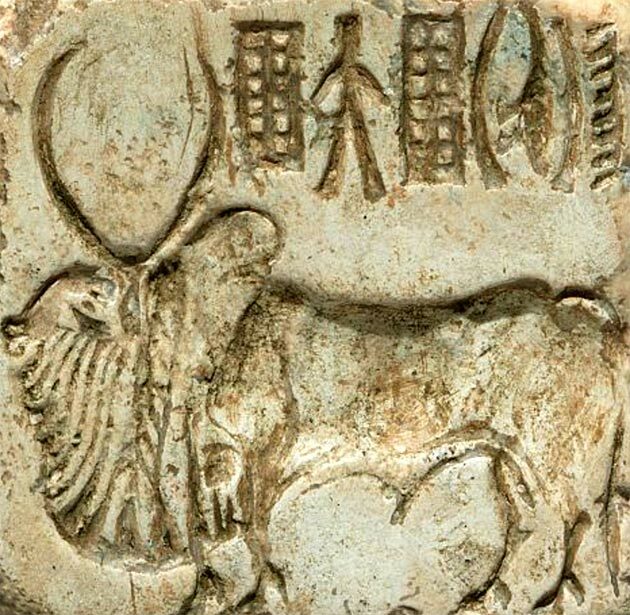 Although competing with other bovines represented by the Harappans, Bos indicus seems from the beginning to have reigned supreme outside the Harappan empire, and to have become virtually the universal domestic breed of cattle in the Indian sub-continent in historic and modern times. Identified remains of water buffalo (Bos bubalis) are comparatively rare in archeological sites, and although widely used today the buffalo enjoys neither the prestige nor the affection bestowed upon the cow." R. and B. Allchin, Some New Thoughts on India Cattle, South Asian Archaeology 1973, p. 71.